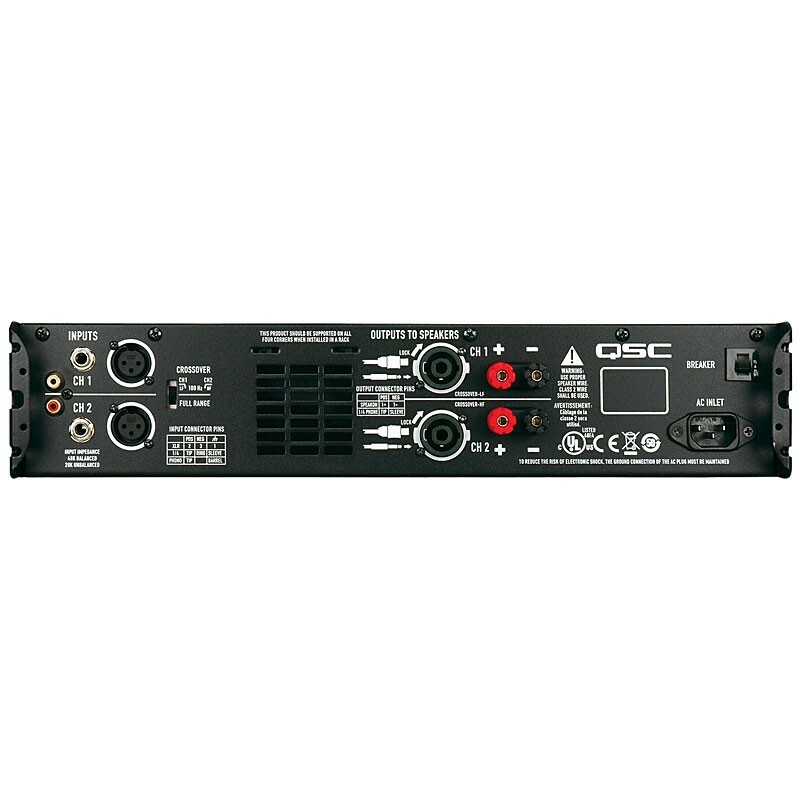 GX Series amplifiers are ideal for professional entertainers who require maximum performance and portability on a limited budget. 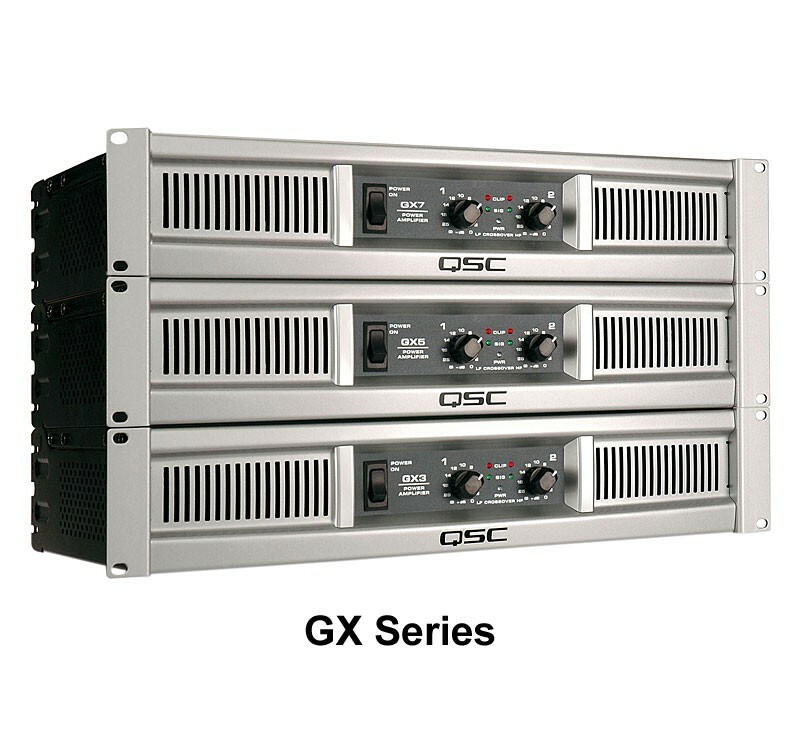 The hallmarks of the QSC brand—professional audio quality, meticulous engineering, precision manufacturing and long-term reliability—are all intrinsic to GX. Add contemporary styling, multiple input/output options, lightweight, and advanced protection circuitry, and the GX Series clearly represents real value—something everyone can use. 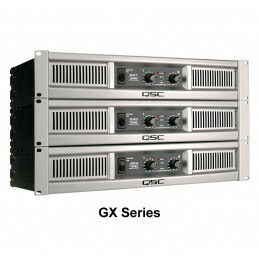 GX amplifiers deliver just the right amount of power to the most popular speakers used by entertainers. Typically, loudspeaker manufacturers recommend an amplifier with power output equal to the speaker's "Program (Music) Power" rating or two times (2 x) the "Continuous (RMS) Power" rating. The GX3 is ideal for speakers in the 300 watt (Program) range, while the GX5 provides full performance for 500 watt (Program) speakers. The GX7 outputs 725 watts into an 8 ohm load. Owners of popular 4 ohm loudspeakers (such as dual-woofer, two-way models) will find the 700 watt (4 ohm) power of the GX5 an ideal match while the GX7 1000 watts will very capably power many of today's popular subwoofers or two typical 8 ohm speakers per channel. Both amplifiers use premium toroidal power transformers for reliable "mid-weight" performance. A variable-speed fan moves air crosswise through the amplifier, drawing cool air in over the power transformer, through the fan, and then over the heat sink. This keeps the transformer cool and allows a full size heat sink to fit in a down-sized chassis. The GX7 adds the road-proven PowerLight supply to the Class H output section, for more overall output power and additional weight savings. The result is one of the highest power-to-weight ratios in the industry. A low-noise variable-speed fan with rear-to-front airflow keeps amplifiers and racks cool. A subwoofer reduces strain on the full-range speaker, allowing it to play louder, or letting a smaller speaker do the same job. The GX Series supports this mode with a Crossover switch that splits the full-range input entering Ch 1, sending 20 Hz - 100 Hz to the sub (Ch 1) and 100 Hz - 20 kHz to the top box (Ch 2). The front panel gain controls balance the sub and top box, while GuardRail optimizes peak power into the sub and top individually, for greater musical impact and dynamic range. GuardRail optimizes peak power into the sub and top individually, for greater musical impact and dynamic range. Amplifier & Load Protection: Short circuit, open circuit, thermal, RF protection. Load protected against DC faults.